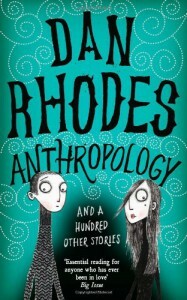 Anthropology is my first foray into the vast and strange world of Dan Rhodes mind and I don't think it will be my last. This 101 page book somehow manages to may every single page story relatable, funny sad and poetic. Ranging from the silly ('My girlfriend was lost in space') to the downright bizarre ('I found my girlfriend smashing our two year old's toes with a rock'), I read the whole book in one sitting but would have happily read five or six. The above quote was the story I bookmarked and it's easily my favourite. Despite many of these stories being downright weird they're also relatable. I did definitely get a Tim Burton feel from these and if you're a fan of his work, this book is definitely for you.